Abuzz with energy the Aloft Plano Hotel is a bold, new hotel experience. Situated in the heart of the booming business area of Plano, Texas the hotel is just minutes from big businesses like Cadbury, Ericsson and Oracle just to name a few. While you're here self-indulge at the many shopping, dining and entertainment options in the area. 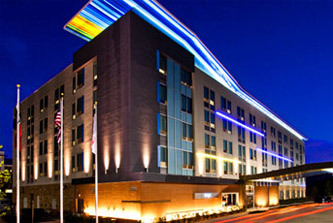 Aloft Plano Hotel is unlike any of the other boring hotels in the area. Grab a glass of vino or some delectable tidbits at the w xyz bar, shoot a game of pool, watch the big game or surf the internet using our complimentary WiFi throughout the hotel. Our Aloft guestrooms provide the comforts of home with our ultra-comfortable signature bed, oversized showerhead, custom amenities by Bliss Spa and more. Our plug & play connectivity station charges all types of electronics and links to the 42" LCD TV to maximize work and play.